First thing that amazes you in Istanbul will be the Bosphorus – for sure. Beautiful palaces, mansions, towers and mosques lining the coast, two bridges that shine in every color in the evenings and classy Istanbul ferries invite you to start exploring the city from the Marmara Sea. Be quick – otherwise there won’t be any seats left in the open area! Finally you’ve found a seat in the open area. The sun is shining smoothly in the morning and you are feeling a sweet breeze on your face while the ferry is moving slowly. In that moment you will see seagulls hovering and waiting for you to feed them. Be calm and buy a simit from the seller on the ferry to throw to seagulls in small pieces. This round-shaped bread, a.k.a. Turkish bagel, is another symbol of Istanbul. Once you’re done feeding seagulls, go ahead and buy a simit for yourself, and enjoy it with Turkish tea and a piece of cheese. Once a year a marathon called “Istanbul Marathon” is held between the continents Asia and Europe in Istanbul. Everyone, including professional sportsmen, can participate in this marathon and walk/run from one continent to the other. Running is not for you? Then try swimming between the two sides of Istanbul in Bosphorus Cross-Continental Swimming Race. 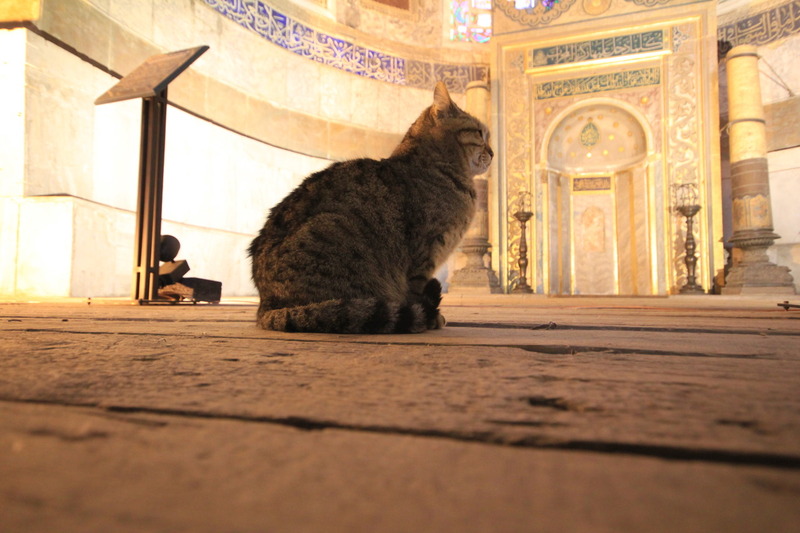 Even though there are many cats on the streets of Istanbul, did you know that the one in Hagia Sophia had a blog dedicated to him? Luckily, there are many more historical sights that are not lost behind the fame of a cat yet, such as Sultanahmet Mosque, Topkapı Palace, Chora Church, The Basilica Cistern, Dolmabahçe Palace and so on. Oh no! You lost your way, which is normal for Istanbul. You approached an Istanbuller and asked him how to find an address. He starts giving the directions in Turkish by arm gestures, but that is useless, obviously. In that moment, the shopkeeper nearby steps in – and his friend, and then his friend’s friend... After a long discussion of those local people among themselves, finally you get your answer. This is how Turkish people demonstrate their helpfulness and hospitality. There are many bazaars in Istanbul, including the most-known ones. Such as the Grand Bazaar and Spice Bazaar. Those Turkish delights (lokum) in every taste and color, different kinds of herbs and spices, silk shawls will blow your mind – unless their prices do before. Do not worry, meet the Turkish art of bargaining: “Another shop is selling it for less.”, “If I buy more, what would the price be?” and finally, “I will buy it if you make it X Liras.” If he doesn’t go down, just leave the shop in a decisive manner - in most cases, he will run after you and try to change your mind. Suppose you want ice-cream so badly. As you know Maraş Ice-Cream is the most famous one in Turkey, which can be found in ice-cream stalls with a seller wearing fez. However, getting the ice-cream has never been this hard! The seller will do anything not to let you catch the ice-cream cone. Try it if you trust on your reflex. ice-cream in Istanbul from Arna Kirilenko on Vimeo. The night has come, meaning bars and clubs of Taksim are calling you! Get dressed and lose yourself in some well-known clubs to live music such as Babylon, Hayal Kahvesi or Jolly Joker. Or you may prefer just drinking in a bar, there are plenty on Asmalimescit or Nevizade streets. On your way back home, do not forget to try rice-stuffed mussels on the street. “Wet hamburger”, invented in Istanbul, is another option for late-night eaters. Tripe soup, variety of döner sandwich and many more is awaiting. There are very few cities in the world which has a population of over 14 million. The life in city never stops. At first you may be surprised by the crowd, but later you will keep pace with the chaotically beautiful environment of Istanbul.